As we celebrate our 14th Anniversary in this issue, we present a league of 14 sensational sport stars who found unconditional love with their four-legged furry companions. Of them, there are soccer stars who kicked around the green grass grounds at FIFA World Cup 2018 in Russia and others including our very own Indian sport stars. This Argentine soccer ace, who is a fantastic forward in FC Barcelona, is not just one of the greatest ever footballers we have witnessed but also a superb pet parent of a French Mastiff named Senor Hulk. Neymar aka Neymar Jr, yet another FC Barcelona player and key player in the Brazil national team, is a proud pet parent of Poker, a Golden Retriever. Portuguese football player and Real Madrid star Cristiano Ronaldo is often captured with his adorable Labrador named Marosca. 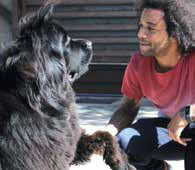 Brazilian footballer Marcelo Vieira, who is better known for being the Real Madrid defender, is a great dog lover and pet parent of six furry babies—Lola (Newfoundland), Kiara & Ully (French Bulldogs), Thiag (British Bulldog), Bella (Miniature Pinscher) and Nalla (Labrador). Chile’s key player in the national team and a forward for English Club Arsenal, Alexis Sanchez plays other games too in his yard with his beloved two Golden Retrievers named Atom and Humber. English national team captain Harry Kane plays a forward for Premier League Club and he loves to always de-stress in the company of his two Labradors named Brady and Wilson. This key Arsenal player, who was fearful of dogs before, decided to bring home a pug to defeat his fear; he named the furry buddy Balboa after Sylvester Stallone’s character in Rocky movie. 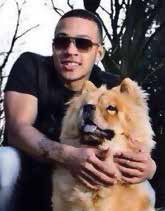 Dutch footballer Memphis Depay who plays as a winger for Lyon and Netherlands national team, is often seen strolling on tranquil pathways with his Simba, a Chow-Chow. Manchester United defender Chris Smalling is a proud pet parent of Miley, a Cocker Spaniel-Jack Russell, who has been branded football’s most pampered dog due to the luxury lifestyle provided by the English footballer and his model girlfriend Sam Cooke. Even the grand slam world has succumbed to the charm of pooches as Serbian tennis star Novak Djokovic is proud pet parent of two Poodles—Pierre and Tesla. Again, another tennis star in the league is Andy Murray who is vey devoted to his two Border Rerriers, named Rusty and Maggie May. He gave Rusty his name after the legendary Lleyton Hewitt, who was Andy’s all-time favourite player and Maggie May after the Rod Stewart song. 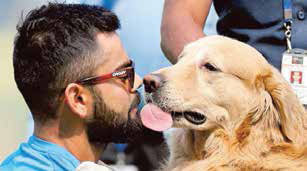 Virat Kohli is not just a champion RCB batsman and a good India captain, but also an ardent dog lover and pet parent of his dog Bruno. 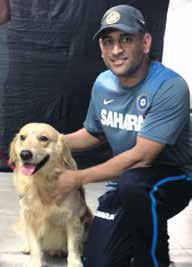 MS Dhoni’s love for dogs is no secret as his Twitter bio says so and he often shared photos of his German Shepherd dog ‘Sam’ and others. 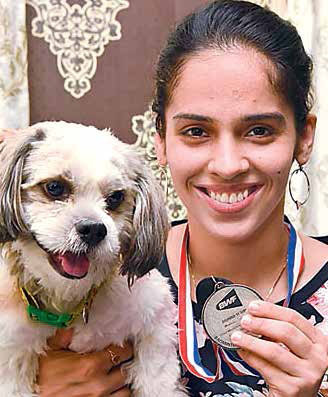 Badminton ace Saina Nehwal has developed a very close bond with her Shih Tzu named Chopsi who helps her relax after a tough day of training.